Challah is a loaf of yeast-risen egg bread that is traditionally eaten by Jews on Shabbat, on ceremonial occasions and during festival holidays. The word "challah" is also used to refer to the portion of dough that is traditionally separated from the rest of the dough before baking. 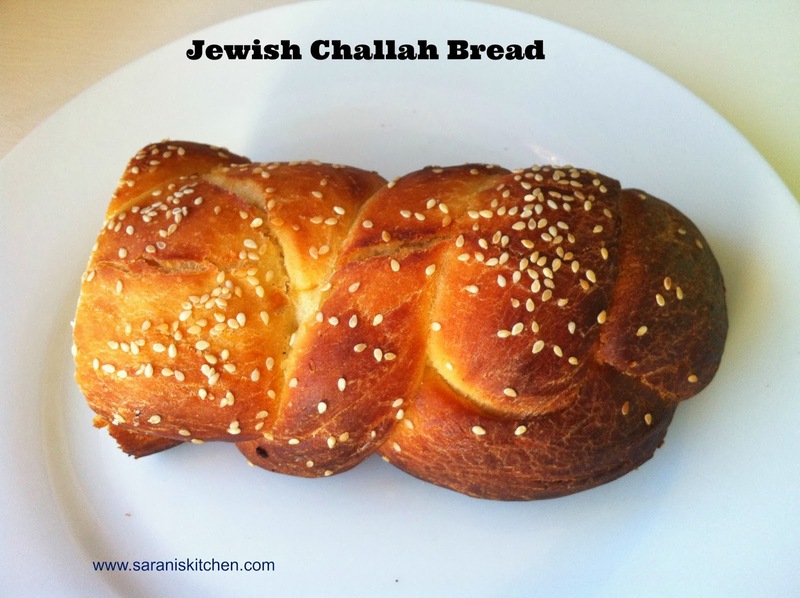 The plural of "challah" is "challot".Challah is often braided using anywhere between two to six strands of dough. I baked this bread for the Home Bakers challenge started by Priya Aks.This month challenge was hosted by innovative and beautiful blogger Priya of cook like priya. Her choices of challenges are just amazing and she chose varieties of cookies, breads and cakes which suits perfectly for the christmas celebrations.From her wide choice i picked this soft, fluffy bread. Sprinkle the yeast over the warm water in a small bowl, and add a tsp of sugar. Stir to dissolve the yeast and let stand until you see a thin frothy layer across the top. This means that the yeast is active and ready to use. In a mixing bowl whisk together 4 cups of the flour, sugar, and salt. In a small bowl whisk the eggs,egg yolk and oil. then add to the flour mixture and whisk these together to form a slurry, pulling in a little flour from the sides of the bowl. With a dough hook attachment, knead the dough on low speed for 6-8 minutes. (Alternatively, turn out the dough onto a floured work surface and knead by hand for about 10 minutes.) If the dough seems very sticky, add flour a teaspoon at a time until it feels tacky, but no longer like bubblegum. The dough has finished kneading when it is soft, smooth, and holds a ball-shape. 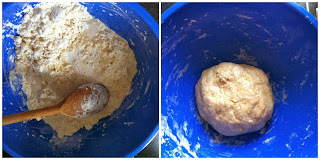 Separate the dough into three or six equal pieces, depending on the type of braid you'd like to do. Roll each piece of dough into a long rope roughly 1-inch thick and 16 inches long. If the ropes shrink as you try to roll them, let them rest for 5 minutes to relax the gluten and then try again. Gather the ropes and squeeze them together at the very top. If making a 3-stranded challah, braid the ropes together like braiding hair or yarn and squeeze the ends together when complete. About 20 minutes before baking, heat the oven to 350°F. When ready to bake, whisk the reserved egg white with a tablespoon of water and brush it all over the challah. Be sure to get in the cracks and down the sides of the loaf. Slide the challah on its baking sheet into the oven and bake for 30-35 minutes, rotating the pan halfway through cooking. The challah is done when it is deeply browned and registers 190°F in the very middle with an instant-read thermometer. Linking this to the Home bakers Challenge. To know more about this challenge click here. 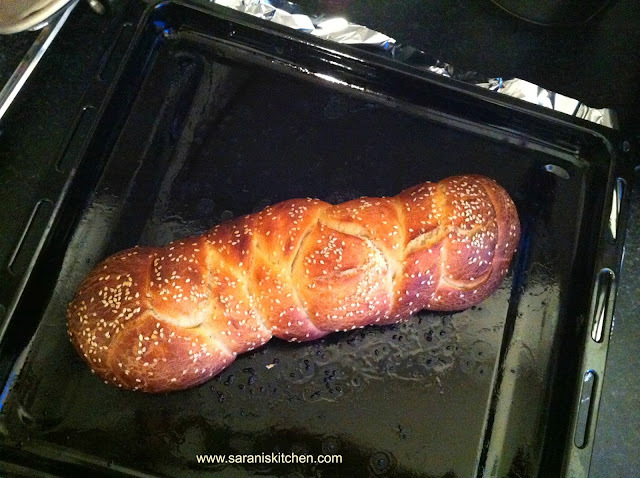 wow such an fabulous challah there :) looks so delicious and perfect baked !! love the colour of the challah. looks delicious. Perfectly baked bread.. The golden crust is beautiful.. Wonderful baking Sarani. So perfect and delicious.